Rock ‘N’ Baga is the brand-new concept night at Bistrot Bagatelle which is set to take Dubai by storm. Hailing from Bagatelle Miami where it was wildly successful, the night is dedicated to timeless hits from the 80’s and 90’s. On this spooky night, get ready for a special edition of Rock ‘N’ Baga with an 80’s & 90’s themed costume party! As always, the entertainment and the vibe of the night will be complimented by Bistrot Bagatelle’s stellar A La Carte menu featuring stand out dishes by Chef Timothy Newton and the team. The kitchen will be pumping out two new dishes to mark the occasion – the R‘N’B Burger and Banana Split, served on Wednesdays only, alongside all the French classics enlivened with a modern twist. So, slip on a costume, grab your friends and join Bagatelle for a spooky blast from the past filled with drinks, bites and rock ‘n’ roll. Set within the serene and verdant gardens of Palace Downtown, FAI’s chic and intimate lounge setting serves as the perfect venue for after work drinks and tasty bar bites. The Downtown Dubai hotspot is bringing in Halloween with a special offer of 2 for 1 beverages for the entire evening (from October 30 – November 2) along with themed food; all complemented by mesmerising views of The Dubai Fountain and Burj Lake. Details:The offer runs from 6pm onwards. The fabulous food and beverages package, priced at AED 249 for two, is exclusively available just for the spooky occasion, and will include two house beverages and two mains. Put on your zombie costumes and goblin masks to join the Halloween costume contest and for a chance to win two tickets to Dubai Rugby Sevens tournament. Guests will also receive complimentary Halloween-themed beverage on arrival. 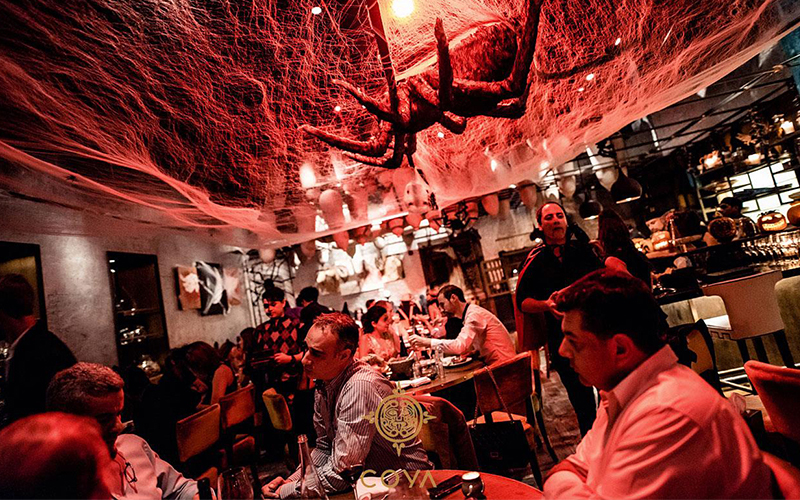 COYA Dubai will celebrate its fourth edition of the ‘Yelloween’ party on October 31st from 8:30pm. Renowned for its extravagantly themed parties, COYA will be reimagined into a spooky festival circus, and guests should don their best freakish circus-themed inspired dress. With tricks and treats in store, guests can expect spooky surprises and performances throughout the evening. Dinner will be served until midnight, followed dance floor mischief accompanied by live performers and DJ sets. A live band will also play in the members’ club as the evening grows later. Details: For more information, visit the Coya website. Ting Irie’s special Pirates of the Caribbean-themed celebration kicks off on November 1st, with its set Caribbean menu designed just for Halloween. Guests can expect to be captivated by Ting Irie’s resident DJ spinning your favourite reggae and dancehall classics, while enjoying an invasion of Caribbean flavour in Ting’s specially-designed Halloween menu. On the night, guests can enjoy coconut shrimps, jerk beef kaboos, citrus roasted chicken, vegetable stamp and go, and tropical fruit tart – all for AED 175 per person. Get ready for a spookilicious time at The Westin Abu Dhabi this weekend, as it introduces its first ever haunted life-size maze to accompany the Bubbalicious Friday brunch at Fairways restaurant. When you’re not enjoying the expansive buffet on offer, guests can explore and get lost in the mysterious labyrinth full of tricks and treats made for kids and kids at heart. Complete with sinister decorations, chilling live entertainment and so much more, this is ghostly brunch not to be missed!